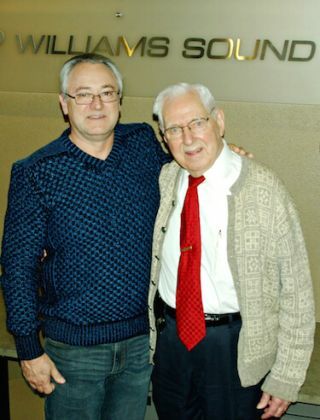 Williams Sound president and CEO Paul Ingebrigtsen (left) with founder Jerry Williams at the company’s 40th anniversary event. Williams Sound held a reception to celebrate the company’s 40th anniversary on Thursday, February 25, offering an opportunity to reflect on its history of innovation in the field of assisted listening technology. On hand was retired founder, Jerry Williams, who provided a brief retelling of the company history to those in attendance—which included a fair number of newer employees who hadn’t met him or had the chance to hear his story firsthand before, according to Williams Sound’s CEO, Paul Ingebrigtsen. Eventually the company expanded as more and more churches wanted to install his systems, and Williams and his wife Lorraine moved the company out of their home and into their first office. As growth continued, they began receiving inquiries from integrators about their products, leading to the creation of a dealer network to distribute and sell the products. Over time, the company continued to build on its success in the portable assisted listening market, expanding its offerings to solutions for schools, corporate, and government facilities. As it expanded, it adopted new technologies: infrared, digital, and induction loop transmission, to complement its core radio-based offerings. Ingebrigtsen, who was the company’s sixth employee when he joined in 1979, and has served as CEO since 1995, attributes the success of Williams Sound under his leadership to his dedication to maintaining the company’s culture, which he likens to a three-legged stool, with legs of internal employee satisfaction, customer satisfaction, and a high level of product innovation. Going forward, Ingebrigtsen said the company’s plan is to continue to “pursue digital audio and digital radio solutions, being part of networked systems, embracing the use of mobile devices and BYOD, and expanding the applications for our equipment.” As an example of this planned expansion, he cited the suitability of the company’s Wi-Fi-based Hearing Hotspot product line for verticals such as hospitality, including hotels, restaurants, and bars, and transportation facilities, such as airports and train stations.